Kellianne on Skis: Look Out Below!! I went to high school in upstate New York. There was a lot of snow. In my opinion, the only saving grace about snow is that you can ski on it. Being a New York transplant and having parents that were not the outdoorsy type, I did not grow up skiing as many of my high school friends did. During the winter months, our high school offered a weekly excursion called Ski Club. I convinced my parents to let me sign up for it. It did not deter me that I had no experience, no skis and no snow bunny apparel. I just had a burning desire to participate in this popular pastime with my friends. The snow bunny apparel became an issue almost immediately. After my first trip to Bristol Mountain clad in an oversized navy blue jacket, navy blue snow pants, some random mittens and a hat that I refused to wear, it became acutely apparent to me that I was committing a dreadful Ski Fashion Faux Pas. Not to mention that navy blue is one of my least favorite colors. I begged my parents for appropriate ski clothing. As an early Christmas present I was allowed to purchase a white SKI JACKET, matching SKI PANTS, SKI GLOVES, and a multicolored knit hat equipped with a festive pompom on top. I had also noticed that it was trendy to wear pins on your jacket collar. I selected a green and white one that read: “Save Time, See It My Way”. I now felt that I was looking pretty swanky for my ski adventures. My swank did not extend to my ski moves. My initiative was to hang with my friends. I could not be bothered to take the time to participate in the free ski lessons that were offered. No, I preferred to flail after them as they swooshed expertly down black diamond slopes. My first and most difficult challenge was getting off the chairlift and out of the way before my chair or the next set of skiers rammed into me. It took me quite a while to master that trick. I spent that winter careening happily down those slopes of Bristol Mountain. 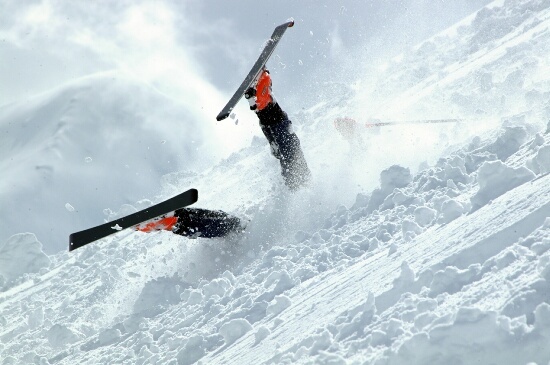 My motto became: “If all else fails, sit down.” Even so, I had some pretty amazing wipeouts. The slang term for that was “yard sale” because really good ones would cause your ski equipment and loose articles of clothing to fly from your person and land scattered about for anyone to scoop up. But, I did learn how to ski that winter, by trial and error, with many bruises, some helpful advice here and there, but without an instruction manual. I can now swoosh down black diamond slopes quite well. I have since learned about myself that I tend to approach many new things in my life in this way. I do not take kindly to instruction manuals, but prefer to figure things out in my own way. I like to be outside the box as much as possible and incorporate the trial and error method with tips added in by those I feel are experts in the area that I am trying to understand. I sift through these gleanings and add my own spin to it. I admit that I am not the most practical person and that I have caused myself and others frustration by being this way, but I have found that I function and flow the best under these conditions. I learn and incorporate and feel like I own it. I also need to point out that the pin that I chose for my jacket “Save Time, See It My Way” was a ridiculous statement for me to be wearing at that time in my life. As a youngster, I was very shy and not willing to make waves about anything. About the same time that I entered into my ski club adventure, I had made another decision. I was going to pretend like I was not shy. I remember that my main reason for this was because I felt like I had so many funny and interesting things to say and I was tired of not having the guts to say them. Somewhere inside I realized that I had to leap off of the sidelines to get where I wanted to be. It was not easy and it felt uncomfortable at first, but eventually I grew into it and it became natural. I have since used this philosophy for other new things that I am approaching. The hardest part is getting down that little hill off of the chairlift, but once you master that, the wide open slopes are there brimming with possibilities. I have come to realize that somehow, way back then, my teenage self knew what I would grow into. Although, in actuality, I would need to add an addition to that pin. It should say “Save Time, (I’ll) See It My Way” because just like I embrace my way of being, I also respect others to have their own way of thinking.